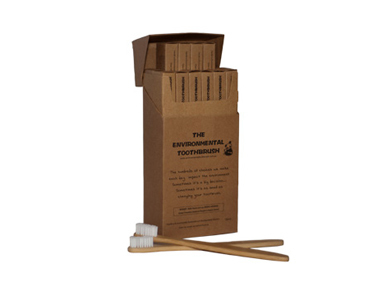 Buy Environmental Toothbrush Bamboo Toothbrush Medium in the UK from our online shop or directly from our independent Scottish store. This environmentally friendly toothbrush is made from bamboo, a natural cellulose fibre, the handles are biodegradable, environmentally sustainable, and do not pollute the environment. Plastic free toothbrushes. Made from bamboo, a natural cellulose fibre, the handles are biodegradable, environmentally sustainable, and do not pollute the environment. The amazing growth and self-renewing ability of bamboo means that deforestation is not necessary either. Even the packaging is bio-degradable. These toothbrushes are plastic free. We sell real Environmental Toothbrush and other Accessories directly from our shop in Scotland and online throughout the UK. View more products from Environmental Toothbrush. Where can you buy real Bamboo Toothbrush Medium safely online? If you are wondering where you can buy Environmental Toothbrush Bamboo Toothbrush Medium safely online in the UK, then shop with us. Bamboo Toothbrush Medium - Environmental Toothbrush Bamboo Toothbrush Medium in Accessories and Personal Care.